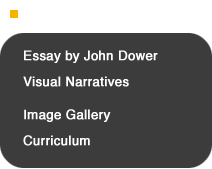 Because the war prints petered out so quickly once it became apparent that the audience for popular graphics had shifted to photography and picture postcards, scenes of battlefield pandemonium are sparse compared to the earlier conflict with China. 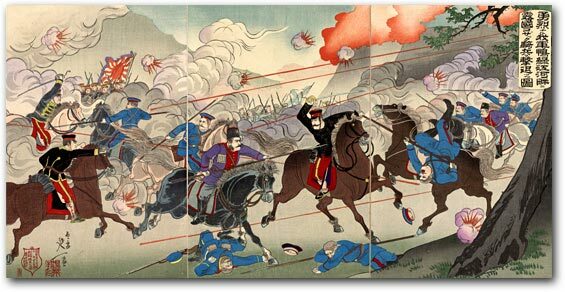 The relatively few such prints that have come down to us dwell predictably on Japanese triumph over an overwhelmed foe, and to a certain degree the Russians are ridiculed and denigrated as the Chinese had been. Russian corpses litter the battlefield. 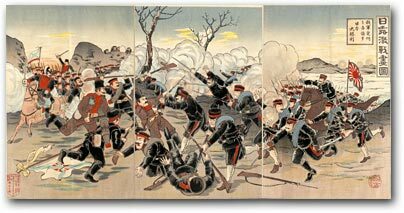 Japanese fighting men stomp on the enemy, run them through with swords, stab them with bayonets, club them with rifle butts. 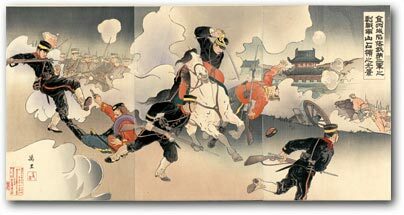 They also pick off smartly uniformed Russian cavalry with their rifles—something not seen in the Sino-Japanese War prints. At the same time, however, it is fair to say that the Russian enemy was also treated with a greater level of overall respect—a greater sense of equality and shared modernity—than had been accorded the Chinese. Nobukazu’s mirror-image fashion plate of Russian and Japanese officers (with which this section opened) is the perfect example of this, but such treatment was not exceptional. 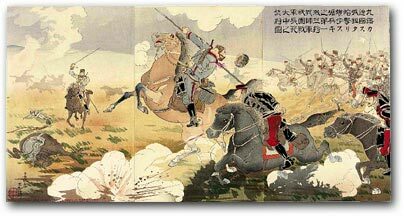 As occasionally happened in the Sino-Japanese War prints, denigration and respect might appear side-by-side in the same print. 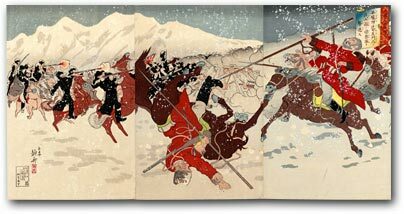 Nobukazu produced a vintage example of this, too, in his rendering of a melee in which brave cavalrymen engage in one-on-one combat in the midst of streaking gunfire. 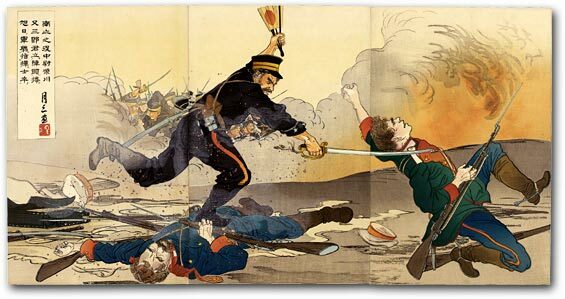 Even graphics depicting Japanese cutting down Russians often convey an impression of physical attractiveness as well as shared modern identity. This comes through strongly in a well-known celebration of the valor of “Lieutenant Shibakawa” by Getsuzō, where the tragic death of Shibakawa’s handsome young Russian adversary is really more striking than the hero’s dramatic pose. 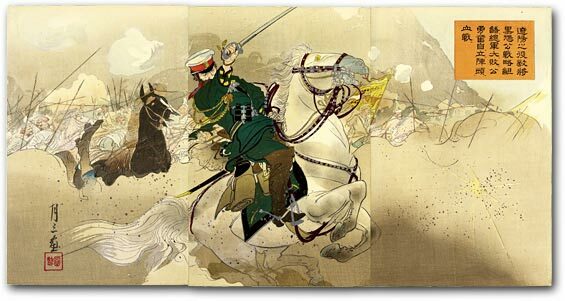 One of the most elegant and well-known Russo-Japanese War prints, also by Getsuzō, singles out the famous general Prince Kuropatkin as an almost perfect model of nobility and valor—charging forward on a handsome white horse to do battle even after his forces had been crushed. 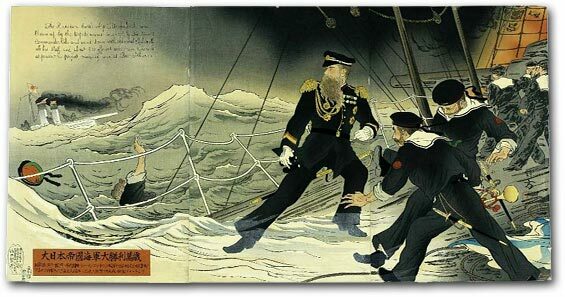 In an April 1904 print titled “A Great Victory for the Great Japanese Imperial Navy, Banzai!”, it is a bearded Russian admiral who holds center stage. He is doomed, clearly about to go down with his ship. But, again, his demeanor is brave and his fate obviously tragic. He is meant to be admired.